40,000 miles Earn 40,000 bonus miles and 10,000 Medallion® Qualification Miles (MQMs) after you spend $3,000 in purchases with your new Card in your first 3 months. 2X Earn 2 miles per dollar spent on eligible purchases made directly with Delta. 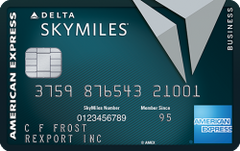 Our take: The Delta Reserve for Business card helps cardholders earn elite status faster while offering a big intro bonus, access to Delta Sky Clubs and more.